From the moment when you have the intention to buy a home to the one in which you are actually enjoying your acquisition, there are some intermediary steps. Once you and the seller negotiate the price and sign the contract, a home inspection follows. The reason for which the inspection is made after the price is established is that there is no point in paying Long Island home inspectors to check the house if there is a probability to not buy it. Let’s assume that you made the deal and you are prepared to be the owner of your new home. There is still one major and necessary step to follow and this is the home inspection procedure. You are directly responsible for hiring an inspector to perform the check, but remember to be selective and choose a professional. The verification of a building is something that must be done in the right way, with patience and attention to details. For this reason, you should try to find a certified and licensed professional. A reliable inspector knows the standards that a building must comply with. After your home inspection in Long Island is completed, any problems that the building may have can be discovered. You can avoid future problems that may cost you money and time. During the verification of your future home, all the parts of the building are checked for structural issues and other types of problems. You as the buyer can decide what parts of the building should be inspected. Everybody plays a useful role in the home buying/selling process. The buyer hires the inspector, the inspector checks the building for problems and the home seller fixes the problems discovered by the inspector. All three parties can benefit: you buy the home, the seller sells the home and the inspector makes money from the verification. During the evaluation, the professional will inspect the foundation, basement, plumbing systems, electrical systems, heating systems, cooling systems, doors, windows, roofs, attic, etc. Of course, there are some parts (like the interior of walls) that are not always inspected. Sometimes, the interior of walls can have cracks. If you know that some of the hidden parts may have problems, make sure the home inspector you select is able to cover these parts. In the bathroom, the presence of mold is verified. Mold can also develop in bedrooms. In bathrooms, there could be some corrosion too. You don’t have to worry that the seller would have a problem with the verification of the home. In fact, the person may seem to be pleased that you will be able to see exactly in what condition the building is. This is very important because it will help both of you to avoid any inconvenience after the purchase is made. Buyers must know exactly what they buy and the price must properly justify the acquisition. You should be aware of the fact that home inspection is mostly about uncovering problems that have a degree of severity from medium to high. 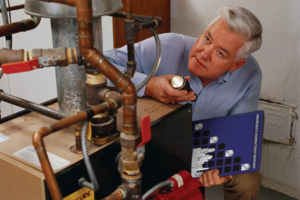 Small issues are not covered, but the inspector may choose to look for small issues if you are willing to pay more.